Today's trip around the world via 5 continents takes us to South America. I has been absolutely ages since I pulled out some of my polishes from Brazil. There's nothing like a nail art challenge to get you back into the depths of your nail polish stash. 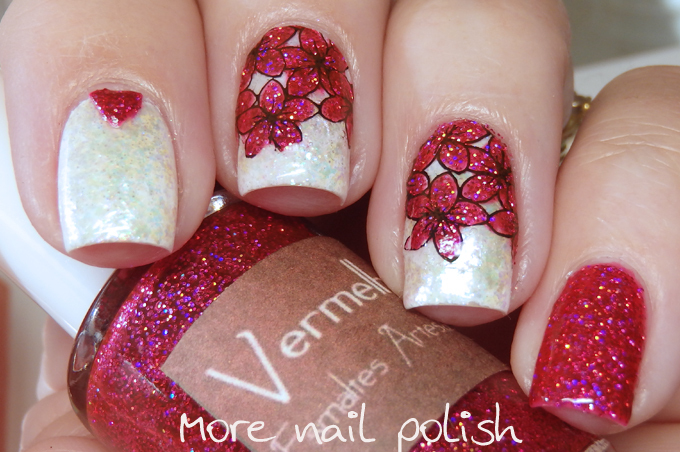 The brands I used for this mani were Esmaltes 5cinco Arco Iris, which is a multicoloured flake polish. I applied it over white, so it was actually really hard to see any of the iridescent flashes. 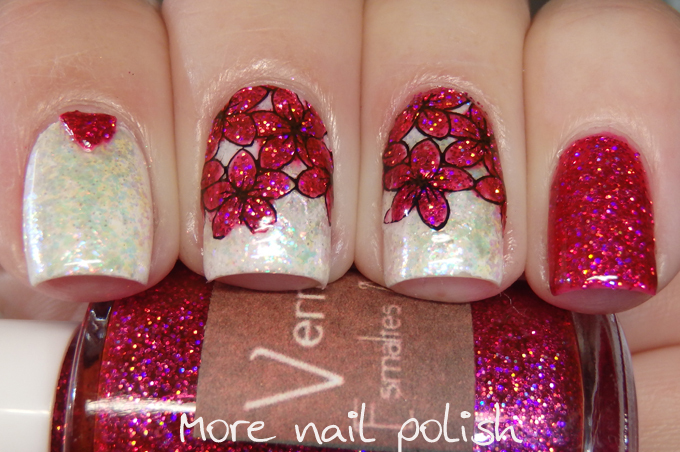 Vermelho Pink Pop which is a hot pink jelly polish with lots of fine hot pink holo glitter. I used stamped with Mundo de Unas, which I believe is a Mexican brand. In keeping with the whole South American continent, I also made the stamping decals using a DRK nail plate, which is a Brazilian stamping plate company. wow!!!!!!!!!!!! so gorgeous. I love the theme you choose. 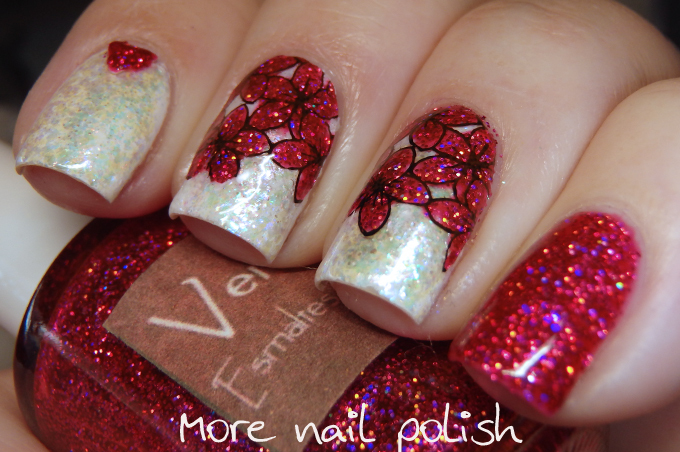 red holo is awesome. Jeez, those sparkles are stunning! I need some South American polishes in my collection! 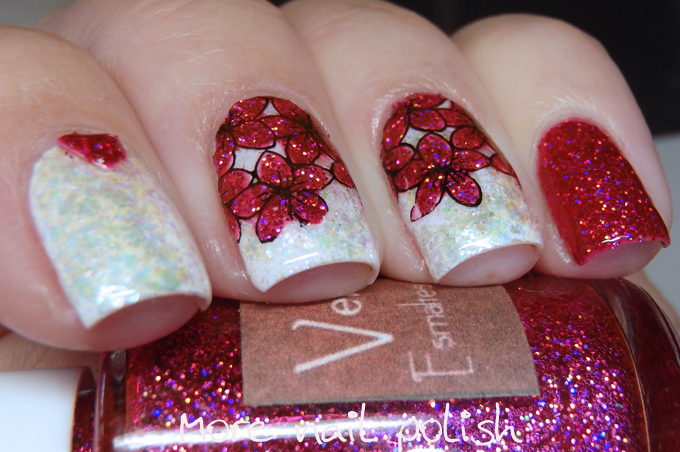 Wow, I love how sparkly these are!! These are beautiful!